Pack a carry on to reduce extra baggage costs and to skip baggage check-in lines. Traveling light should be easier as you can you get your tote shipped to your vacation destination anywhere within the country. Carry an empty water bottle to refill in the airport. Hydration is key for flying! Bring non-electronic entertainment for possible delays. Nothing’s worse than fighting over an outlet at the gate. Bring a travel blanket or oversized cozy scarf. This will come in handy on the flight, and you’ll be a little bit more comfortable while waiting at the gate. Dashing to a dinner straight from the airport? Throw on a statement jacket like Olivia’s Culpo and arrive to the party in style. Don’t wrap gifts. If you do bring Christmas gifts with you when you travel, just remember to save the wrapping until you arrive. Security will likely need to unwrap the gifts to inspect them. Follow your airlines and airports via Twitter. Sign up for your airline alerts to get flight updates e-mailed or texted to your smartphone. 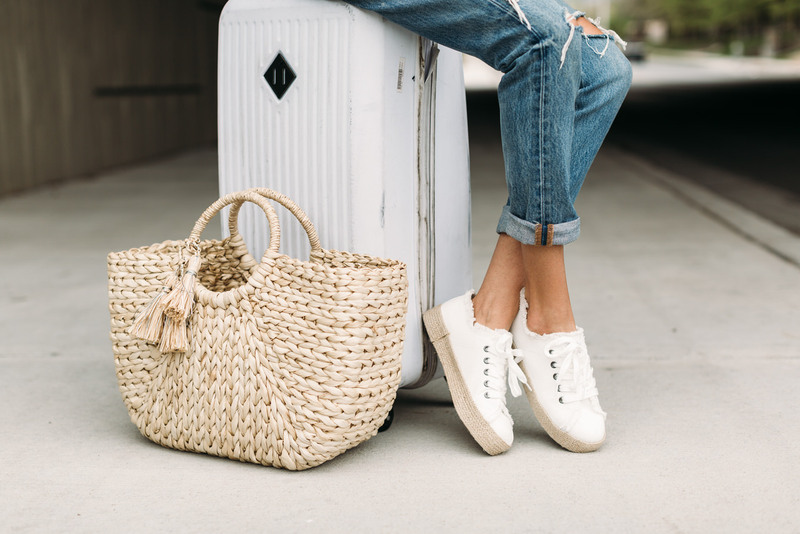 Packing your tote for vacation? Don’t forget to take your prepaid envelope along so you enjoy your tote and drop it off from your destination. This means fewer things to carry back home. It also means less wait time for your next tote!